One of the things I enjoy doing every year is seeing the Holiday Storytellers at Epcot. 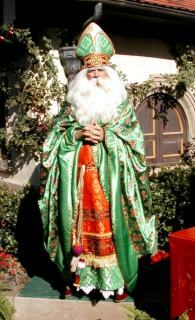 Each country in World Showcase has its own holiday traditions, and at various times each day, a costumed storyteller (or three) appears in each pavilion to describe the holiday traditions of that country. Most (if not all) of them are actors rather than actual citizens of that country but it's still interesting to listen to them. Los Tres Reyes Magos (Three Magical Kings) were the storytellers in Mexico - this is the only place that had more than one. 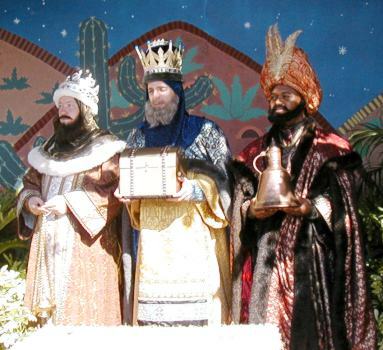 Gaspar, Melchior, and Balthazar described Las Posadas - a nine night festival where "Mary" and "Joseph" seek lodging at different inns (posadas) only to be turned away until the final night. The "holiday tradition" that we have inherited from Mexico is the use of the poinsettia flower, though it's called the "Flores de Noche Buena" (Flowers of the Holy Night) in Mexico. According to the legend of the poinsettia, on Christmas Eve a poor beggar boy offered up a bouquet of leaves, all he had to give, to the Christ Child, and they miraculously turned into a mass of brilliant red blossoms. Feliz Navidad! 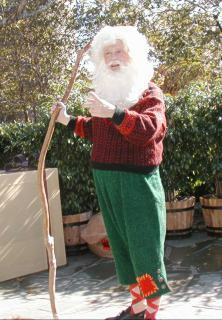 Norway's storyteller, Julenissen, is a gnome (nisse) who lives in the barn and protects the family farm. On Christmas Eve the family leaves a bowl of Christmas porridge in the barn for him. (Gnomes LOVE porridge.) The farm animals get special Christmas feed, and sheaves of grain, called a "julenek" are mounted on a pole to feed the hungry birds. 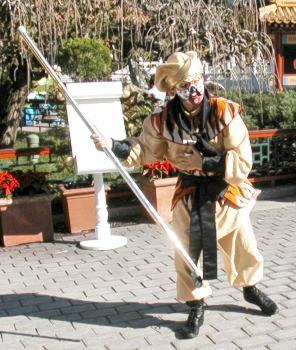 The Monkey King is China's storyteller. Surprisingly he doesn't talk about China's big new year celebration. Especially surprising since 2004 is the Year of the Monkey! His own story is quite interesting, though. He "acquired" a magic stick from the Dragon King which gave him incredible powers (the first superhero?) but got a bit full of himself and into mischief after that...so Buddha imprisoned him in a mountain. But a Buddhist monk asked for his release and the Monkey King redeemed himself in his journeys with the monk. No doubt they were engaged in monk-y business. :-) Gung Hay Fat Choy! 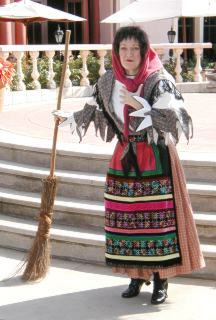 A witch (a *friendly* witch) named La Befana is the rather unlikely storyteller in Italy. She was an old woman sweeping her front steps when the Magi came by and asked for directions to Bethlehem - though they were following the star. The asked Befana to join them, but she "minds her own business" and refused to follow. She soon regretted that decision, but by then the star was gone, and since then she roams the world looking for the "Gesu bambino", and leaving gifts for the children on January 5 (eve of the Epiphany), just in case she's found the child. The tradition of the Nativity scene comes from Italy - St. Francis of Assisi is credited with coming up with the idea. Buon Natale! 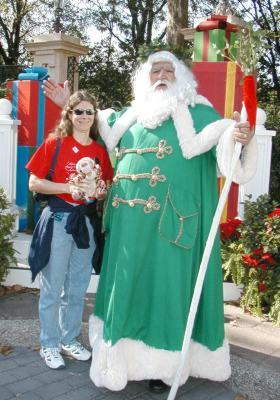 In the America pavilion all Santa does is pose for pictures...rather disappointing compared to the other storytellers! Though maybe because we've borrowed so many holiday traditions from elsewhere, he doesn't have anything to talk about? :-) Ho, ho, ho...Merry Christmas! 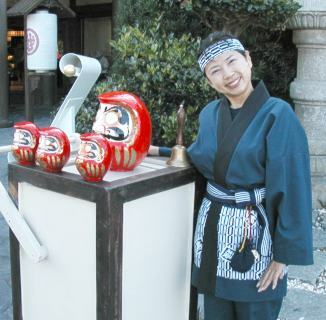 In Japan the Daruma seller describes how they celebrate the New Year rather than Christmas. The Daruma sellers sell these Daruma dolls, that are pretty roly-poly (but not ollie! :-) ) and even when dropped on their heads still end up right-side-up. The name "Daruma" comes from a Buddhist monk by that name - he meditated for 9 years and after sitting in one position for that long, his arms and legs shriveled up and fell off - hence the roly-poly quality of the doll and the proverb associated with it: "fall down seven times, get up eight". Pere Noel told us that the French government even gets into the holiday spirit - they pay the postage for letters to Pere Noel as long as a return address is included. Joyeaux Noel! 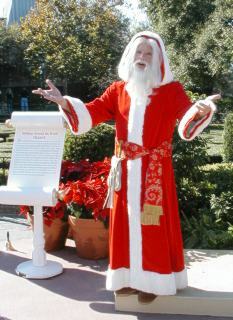 Father Christmas is the United Kingdom's storyteller. Yet another in the series of robed and bearded gift givers who bring presents or coal. :-) (I never did find out where the whole "giving-coal-to-naughty-children" thing started.) Though the idea of leaving presents in the stockings rather than shoes seems to have begun in the UK. Many of our Christmas traditions originated there, like Christmas carols (and caroling door-to-door - "we won't go until we get some! "), the custom of sending Christmas cards, and kissing under the mistletoe. There's also December 26th - Boxing Day, which is the day to box up and return all the gifts you don't like. Oh wait, that's just how *we* do it... :-) In the UK on Boxing Day they give boxes of food and gifts or money to tradespeople or servants/employees. Happy Christmas! Last but not least is Canada's Papa Noel. He's a jolly, manly Santa, dressed in a red-checked flannel shirt, eh? And of course he gets all of his reindeer from Canada. :-) When you consider that Canada was originally settled by the British and the French, it's not surprising that their traditions combine the two - with a little bit of German and Inuit thrown in for good measure. They celebrate midnight mass and Le Reveillon, as well as Boxing Day, and on Christmas Eve the children are visited by Belsnickel (a rather mean character they got from the Germans) to make sure they are behaving, and threatened with the Naluyoks (some nasty Inuit creatures, though I don't know how that's spelled) if they are bad. Merry Christmas! So that's my tale of the storytellers...if you're ever at Epcot during the holiday season I highly recommend that you try to visit at least a few of them. None of their presentations are very long - 5-10 minutes - and they can be very entertaining - especially the Monkey King and Julenissen.